This was definitely an exciting yet daunting project. I come from a background working in the quality control department at a national, nonprofit charitable organization, so I’m no stranger to standard operating procedures and document control. However I have become more chill over the years. Being self-employed (with a spouse) made that necessary. My old bureaucratic ways re-surfaced quickly, especially in the midst of SOP writing. I had to consciously pull back the reins when I felt myself getting carried away with detail. We started the process by sending out a “Request for Quotation” to Pro-Cert in January. We picked Pro-Cert as our certifying body simply because there’s a maple syrup producer on the island that uses them, too (our neighbour’s parents). The auditor’s travel expenses are paid by the companies being audited, so by choosing Pro-Cert we could split the cost. Once we received the quote and decided to proceed, we needed to fill out a “Processor Initial Application”. This process took almost two months as I had to write all the SOPs, create logs and forms and diagrams, gather all the information from our suppliers and products, including products used for cleaning and sanitizing, and fill out the application. Maple Syrup producers are usually audited in early April, or even the end of March, so I knew we were cutting it close. We sent the application and required information to Pro-Cert in the nick of time. We paid some money, got audited, and were now in the “Evaluation Stage” of the organic certification process. In May, I heard back from Pro-Cert, and had to edit all our labels* to include the organic certification information. There are labelling requirements for organic food in Canada, and certain ways to word things (e.g. our labels could say, Organic Coffee, but couldn’t say Certified Organic Coffee. They need to say “Certified organic by Pro-Cert”. The information pertaining to the actual contents of the packaging needs to be bilingual as well (lucky for us we have friends who were able to help us out with this). We had to clarify/rectify a few things, then wait. 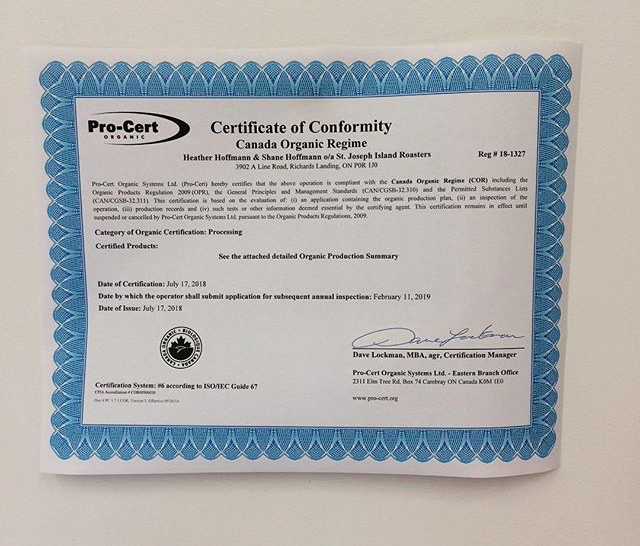 On July 20, I received the news that our operation had been certified organic by Pro-Cert. Mission accomplished. *The labels I edited will never show up on the shelves however, because we have new branding that we’ll be releasing soon. More on this to come!